Are you searching for a product that offers the style and convenience you want without a hefty price tag? Shop at our flooring store and you are sure to make a purchase that suits your aesthetic preferences and lifestyle needs. You can visit our showroom or go online to view thousands of sophisticated styles. You can also preview our products in your home by using our convenient My Floor Style app, which lets you mix and match products from the palm of your hand. Vinyl tile flooring is often the material of choice for homeowners looking to re-floor rooms subject to frequent moisture and messes. Because vinyl imitates the look and feel of traditional tile, but consists of several water-repellant layers, it keeps out water and other substances while delivering the same beauty as true tile. Busy parents love vinyl tile because it's easy to clean with a broom, mop, or sponge. 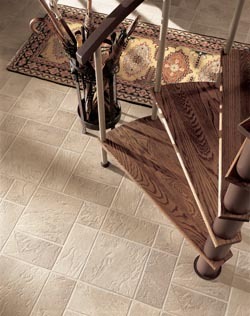 Ask our installation team to lay your pick of vinyl tiles in a distinctive pattern for added appeal. In contrast to many other popular flooring products, vinyl sheet flooring is a relatively affordable choice for homeowners that still prefer a sophisticated look. This material is fiberglass-backed, which makes for a sturdier, longer-lasting home addition. You and your loved ones will find it hard to make a dent in this material's surface; it resists scratches, dents, and scrapes with ease. Though many clients love its durability, it is prized for its softness as well. Your family will appreciate the gentle texture underfoot. If plank hardwood floors are at the top of your wish list, consider opting for cost-efficient vinyl plank flooring instead. This up-and-coming flooring option mimics the look and feel of real wood floors - our clients love that they can see the same grain and knots that appear in real wood planks. The added benefit of these floors is that they are hard to damage. While true hardwood floors need refinishing to buff out scratches and scrapes, vinyl resists most damage. Once you and your family have settled on the perfect vinyl flooring product for your home, be sure to schedule installation with trusted local professionals. Our experienced flooring technicians have the skills and equipment needed to install any kind of flooring product correctly, the first time around. Rely on us to deliver a high-end final product that offers beauty and efficiency for years to come. Contact our flooring specialists to learn whether vinyl flooring is right for your house. We proudly serve homeowners living in Carroll, Lake City, Wall Lake, Atlantic and Ida Grove, Iowa.